An eye-implanted chip from Retina Implant has restored patients’ ability to discern light during its latest trial, according to German researchers. 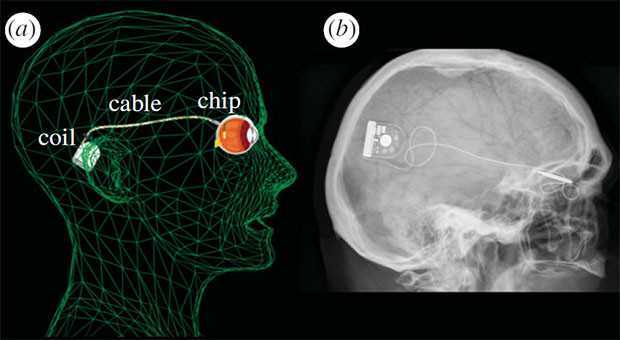 The device works in a similar fashion to the newly FDA approved Argus II retinal prosthesis to return limited vision in patients with photoreceptor cell diseases like retinitis pigmentosa. Unlike that system, however, light is picked up via 1,500 pixels on a retinal implant instead of an eyeglass-mounted camera. The signal is boosted by a coil implanted in skin behind the ear and sent back to so-called bipolar cells still active on the retina, which in turn send an image to the brain through regular neural circuits. A small battery mounted behind the ear — the only external sign of the device — contains controls for brightness and contrast. The recent trial let 8 out of 9 patients see in varying degrees, with three in the study even able to read letters and see the faces of family members. Given that the Argus II finally crossed the FDA’s bionic eye barrier, hopefully we won’t have to wait nearly as long for research like this to become a product.